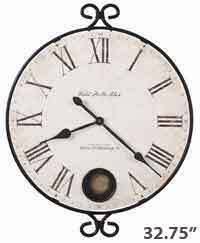 The Howard Miller Clé Du Ville 625-579 Large Wall Clock is a 26.25" diameter oversize gallery wall clock features an antique dial within a wrought iron frame with an oil rubbed bronze finish. 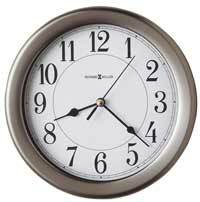 Cast antique key hour markers are unique and different and are applied to the dial. The aged parchment background includes names of well-known French cities faded in the background. Applied vintage skeleton key hour markers and spade hands finished in oil rubbed bronze complement the frame. Quartz battery-operated movement requires one AA battery. 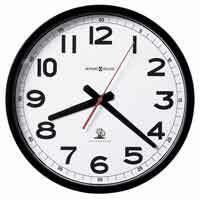 Clocks for sale at The Clock Depot including the 625-579 at discount prices.